Do you think that whatever is difficult or beyond difficult in your life first requires some magical answer that will change everything for you? Many people, without realizing it, “think” or feel this way. It is a natural reaction, in many situations, in life to feel as though where you currently are, what you are currently dealing with or putting off dealing with is just too huge for you to figure out or manage. The first step on any recovery, healing and/or growth journey is to be accepting and mindful of how one small choice can be that first step, leading to subsequent steps, that can turn your life around. That can take you from despair, loss, grief, relationship break-up, being shattered and lost to yourself during or after Cluster B abuse – Narcissistic abuse – through a process of finding clarity from confusion, brain fog, the cognitive dissonance, and the separation of you from yourself. One small decision to put yourself first. To put your mental health first. To put your physical health first. To slowly shift your focus from the abuser or the reality of your pain to yourself in a loving-kind way that will help you to overcome that internalized negative inner critic and define or re-define who you really are. The small decision is to first know that you need help and support and more information. That you deserve this. That you cannot deny or escape what you’ve been trying to escape. You certainly can, however, make that very first small decision to take your own journey. The decision is not huge. The journey may not be small, easy, simple, short or painless. However that journey is the first one small choice that is the only way from where you are to where you want and deserve to be. If you haven’t already, what is stopping you from making that first small decision in your internal landscape of all that feels overwhelming and may well be thought of as huge? 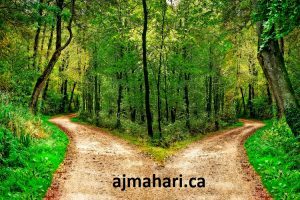 Just one small first decision will open the way forward in your life through a journey that you cannot yet know what your opening to it and unfolding it will mean for you. The greatest journeys begin with that first small decision, a focused decision, to begin to walk a path, one step at a time, that you can’t see where it is leading you. Scary, yes, but also, if you let it be, exciting. This is how a small decision can, over time, turn your life around. Realizing the wisdom and truth in that small decision that is both a crisis but more importantly also, such a growth opportunity. As with everything in life, growth, healing and change – these sacred journeys do require of us that we face pain. Face pain, confusion, loss, grief, challenges of all kinds in life, safe in the knowing that one small decision can make all the difference in your world. This one small decision about an occurrence, a situation, a dilemma in your life, see you standing on a path, at the intersection of two choices. One choice, one small decision, can lead you, one step at a to so much growth and movement forward in your life. Do not remain stuck, afraid to make one small decision that can turn your life around. Choose that path least taken. Choose the journey that you now find yourself fearing but equally as much needing and wanting. © A.J. Mahari, February 2, 2019 – All rights reserved.